In just five short years, Shun knives have gone from nonexistent to top dog among high-end kitchen knives. Their ascendancy has been nothing short of breathtaking and has been met with serial defections from industry household names Henckels and Wusthof. Their prominence is well deserved. While Global first introduced many Western restaurant workers to high-performing Japanese knives, Shun brought the concept to the mainstream. Shun proved a lot of doubters wrong when it showed that the West was ready for premium knives that were razor sharp and lightweight. Shun knives were more expensive than their predecessors and in need of more preventative maintenance but once amateur chef’s got their hands on them, they never went back. See our article The Rise and Fall of the Great Knife-Makers for more details on this transformation. Shun knives are made by Kai Cutlery, a large and well respected Japanese blade-making firm. Kai purchased Kershaw Cutlery in 1978 and formed Kai USA to manufacture and distribute American-made knives. When it became clear that there was a market for high end kitchen knives using age-old Japanese knife-making techniques, Kai was perfectly positioned to lead the charge. Their Shun Knives were first introduced in 2003 and have since become the knives of choice at such retailers as Williams-Sonoma, Sur La Table and Crate and Barrel. 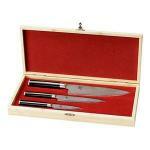 Aimed squarely at the enthusiast home chef, Shun Classic Knives are the most popular of the Shun lines. They use a Japanese steel called VG-10, which is much harder and sharper than most European steels. Many people agree that the sharpness, coupled with a lightweight feel and a traditional Western handle makes for an excellent combination. These knives are not intended to be put in the dishwasher, or to be left soaking in water. 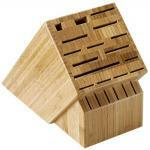 The thin, sharp blades can easily be dulled or stained by such use. The handles are made of pakka wood, a resin-infused hardwood, and given a teardrop shape that allows them to fit comfortably in the hand. Some will argue that Shun Classic knives are expensive. And it’s true that, with an eight inch Chef’s knife starting in the $100 range, these knives are not for the spendthrift. But Kai felt that premium materials and premium performance demand a premium price. And these knives certainly deliver on that. The Shun Elite series is Kai’s second most popular kitchen line. At first glance, they may seem similar to the Classic knives. But there are some important distinctions here. The most important is the steel. Elite knives are made of SG-2, a premium “powdered” alloy. Powdered steels are created through a unique process that allows uniform distribution of elements throughout the material. This creates a steel that can be made extremely hard and, therefore, sharp. The handles are pakka wood, similar to the Classic knives. Care and maintenance is similar as well. Ken Onion is probably the most well-known knife designer alive today. Ken invented “Speed Safe”, a ground-breaking automatic knife-opening mechanism. Ken designed several ground-breaking knives for Kershaw, including the Chive, the Leek and the Blackout. Ken Onion had no prior experience designing kitchen knives, but agreed to take on the task nonetheless. This inexperience was actually beneficial to Ken as it caused him to question some of the basic assumptions behind kitchen knife design. His resulting Shun Ken Onion line features a damascus-patterned VG-10 blade, pakka wood handles and, most distinctively, an ergonomic shape designed to limit arm fatigue during long chopping sessions. Not all are fans of the knives unique shape. Some complain that the ergonomic design works well only for some hand sizes. But many industry professionals swear by them, and they’ve developed quite a significant following. The Shun brand also includes a few lesser-known lines. Shun Steel knives feature a stainless steel handle. Shun Pro knives feature a single-bevel that allows for a narrower edge angle and, therefore, a sharper blade. Shun Pro II features a patterned handle, a slightly thicker blade as well as Shun’s sharpest blade. Kai also offers budget knives, distributed under the Kershaw Wasabi name. Shun knives can be found at many major retailers, including Amazon.com. We’ve written several in-depth reviews of individual Shun items that you might want to check out before purchasing. Those are listed below. 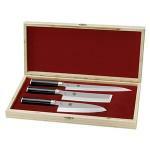 This set of three professional quality Asian chef's knives from the Shun Pro series comes in a velvet-lined wooden presentation case. Each knife bears the etched signature of Chicago Chef Laurent Gras. With many of the same good features as the DMS 400 plain-edged steak knives from Shun Cutlery, this Classic DMSO420 Steak Knife Set adds serrated blades for even better edge-holding. These beautiful knives will draw nearly as much attention as a good steak. The DMS400 Classic 4-Knife Set from Shun Cutlery brings the fine Damascus-like steel and ebony-black pakkawood of Shun kitchen knives to the dinner table. Adding these two knives to your kitchen lineup could greatly improve the quality of your day. 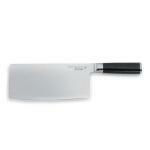 The santoku and paring knife from Shun Cutlery will handle most of the vegetable slicing and prep work you do. 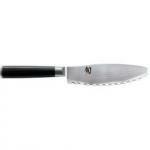 The Birds Beak Paring Knife from Shun handles difficult tasks many chefs don't find essential. If your cooking includes sculpted fruits and vegetables, exotics like Bride's Tears potatoes, or even the common ginger root, you'll find the Shun Birds Beak Paring Knife very handy. Shun Cutlery's Classic Carving Set brings that company's famous VG-10 Damascus style stainless steel to the dinner service. 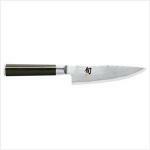 The look is the same as that of Shun's other chef's knives, with an elegant and simple ebony-style pakkawood handle and a forged stainless steel blade. If you can get past the non-traditional aesthetic, there's actually a lot to like about this Ken Onion design from Shun. In my experience, I've found little use for the traditional "carving knife". In my view it's a specialty knife. I generally prefer to use knives which are a bit more utilitarian. 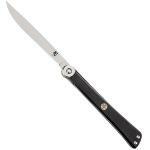 Made to Shun's exacting standards with the same materials as their Classic series, this 4 3/8" Chef's Knife follows a design by famous American knife maker Ken Onion. 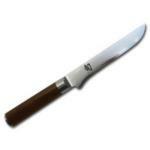 This beautiful knife makes a practical addition to any cutlery set, with features suitable for collectors. Japanese blades of all kinds, from swords to carpentry tools, are so refined that to many Westerners the subtle features go unnoticed. The Nakiri vegetable knife is a fine example of a craft so skilled it may cause you to rethink the basics and become a better chef. Seki, Japan, where the Shun Classic Ultimate Utility (U2) is manufactured, has a long history as a center of Samurai sword production. Many of the old techniques that produced these legendary military blades have now been transferred to high quality cutlery such as the U2. Since Shun knives are so well known for their quality and traditional craftsmanship, you shouldn't expect anything less from their storage block -- a product designed to store them carefully and keep them sharp for their next use. Fortunately, that's what it does. If you were to refer to this in the proper Japanese terminology, this would be called a petty, which evolved from the term "petit gyutou" or "little cow sword". If you're going to spend decent money on a knife, make sure it's one that you'll use frequently, feels comfortable in your hand and is made of premium materials. This Shun Classic Paring knife earns our recommendation as the "Best Paring Knife" by fulfilling those three criteria. We named Shun Classic Knives our best $500 kitchen knives a while back, and for good reason. 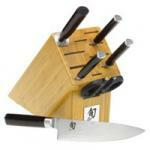 Many amateur chef's are intimidated by knife sharpening. While unafraid to tackle a dinner party for twelve, they've been told that knife sharpening should be done by a professional. For many Chinese chef's, this type is not just an essential knife, but rather the single most essential knife in the kitchen. Shun knives are by no means budget knives. Some consider them synonymous with "expensive". But limit yourself to a small set of essential knives and you'll actually find them worth every penny. You may know that Shun and Kershaw brands are both owned by the same company. You may also know that Ken Onion is one of the most successful designer of Kershaw knives, winning numerous industry awards throughout his career. This is the top of the line for Shun. Their Shun Classic Knives are excellent, lower-priced knives. What this knife has over the Classic knife is the steel. It's a powdered SG-2 steel, which is pretty much the highest-end steel you're going to find in a kitchen knife.